Precision Gears known for their good long lasting performance and constant motion under heavy loads and this is the reason that these gears are used in various heavy machined industries. As a Precision Gears Suppliers we known for quality and performance like our other products.As more than 50 years of experiences we can say precision gears is a object which gives accurate motion in different type of loads and maintain smoothness and accurate performance results. Heavy industries, Cement Plants, Sugar Plants, Mining, Agriculture, Defense, Marine, automation and Industrial equipments etc. Material: MS or Alloy Steel, Carbon Steel and according to the customer requirement and suggested material. We manufacture custom precession gears according to customer material and specifications. 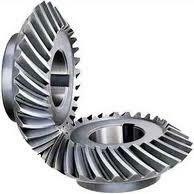 Type: Spur or Helical Gears, Motor Gears, Slewing Ring Gears, Timing Gears, Pump Gears. Capacity: 200mm to 1200 mm outside diameter.